The new Delightfully Detailed Laser Cut Paper is sooo gorgeous that you won't want to miss a trick with it and there are lots of ways to incorporate it into your projects! These two cards I made by sponging a piece of the new Delightfully Detailed Laser Cut paper with Sahara Sand ink. By placing a piece of Whisper White cardstock under the lattice while sponging, I created a second lattice background at the same time. You can see more examples of this here and here using Blueberry Bushel ink. In the first card, my Sahara Sand lattice is placed on top of the Early Espresso base card. I then added the Petal Pink floral pattern that was cut with one of the Eclectic Layers dies (I trimmed around the edges with my snips). I also added some of the little diamond shapes left over from the die cutting. 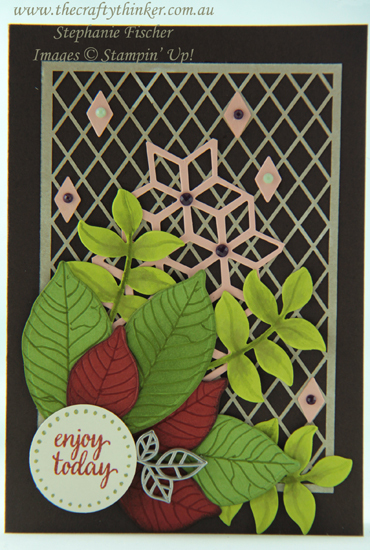 I cut the single leaves from Cajun Craze and Pear Pizzazz cardstock with the new Nature's Roots framelits and embossed them with the matching embossing dies in the set. I then ran a matching Stampin' Write marker along the embossing and added a bit more colouration with watercolouring and sponging - I can't remember now why I didn't stamp them with the coordinating Rooted In Nature images (these can be purchased as a Bundle at a saving of 10%). The remaning leaves are cut from Granny Apple Green cardstock (a new colour in the palette) and I added some shading with some watercolouring. The greeting is from the Eastern Beauty stamp set, punched out with a 1 1/4" circular punch. The finishing touches were one of the new Leaves Trinkets and some Faceted Dots. So the lattice background in this card is a by-product of the first card and I added it to a Night of Navy base card. I then added strips of the Delightfully Detailed Laser Cut paper that I'd sponged with varying amounts of Night of Navy ink - if I'd sponged them on top of strips of cardstock, I could have used those decorative strips on yet another card! 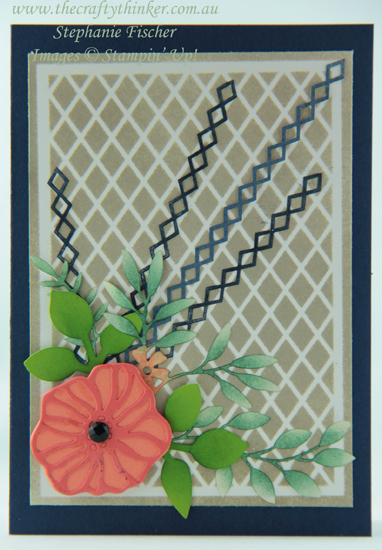 I cut the flower with the Eclectic Layers dies from the Grapefruit Grove cardstock and Calypso Coral. The centre is one of the new Faceted Dots. Using the new Granny Apple Green cardstock I punched twice with the Leaf Punch and then sponged with a little Tranquil Tide ink. The remaining delicate leaves and small flower are cut from a piece of the Delightfully Detailed Laser Cut paper and sponged with Mint Macaron and Grapefruit Grove inks respectively.